When considering LASIK, KAMRA, PRK, ICL, or any other vision correction procedure, as with any kind of surgery, the primary considerations should be safety and results. At Hoopes Vision, our commitment is, and has always been, providing our patients with the safest, most effective, most advanced vision correction procedures available anywhere. While our main goal is to provide patients with the very best in surgical vision correction by placing the newest technology in the hands of the most experienced surgeons, we also work to bring this level of treatment within the reach of almost any budget. Vision correction surgery represents a significant investment, and it’s understandable that someone looking into these life-changing procedures would want the best available value for his or her money. This is good news for Hoopes Vision patients as people are often surprised to find that the price of LASIK, PRK, or ICL at Hoopes Vision is comparable in price to the so-called “discount” centers. In fact, once you factor in the post-operative care and the lifetime See Clearly Guarantee – both of which are included in the price of surgery at Hoopes Vision, whereas they are separate costs at many centers – Hoopes Vision looks like a better value than ever. The price of vision correction surgery varies according to the type of laser procedure that is best for the patient. We offer a free, no-obligation LASIK exam with our doctors and LASIK surgeons to help each patient determine if he or she is a good candidate and to determine the cost of their individual LASIK. Hoopes Vision is proud to offer financing through Care Credit. We have several different payment plans available, including no-interest financing for up to 18 and 24 months, or extended terms of up to 60 months. Plans are available to make LASIK fit into nearly any budget. Details on Special Financing Offer Valid on CareCredit account. A minimum purchase amount may be required for promotional plans longer than 6 months in duration. On promo purchase balance, monthly payments required, but no Finance Charges will be assessed if (1) promo purchase balance paid in full in 24 months, and (2) all minimum monthly payments on account paid when due. Otherwise, promo may be terminated and treated as a non-promo balance. Finance Charges will be accrued at the Purchase APR and assessed from purchase date. Standard terms apply to non-promo purchase and optional charges. Promo purchases on existing accounts may not receive full benefit of promo terms, including reduced APR if applicable, if account is subject to penalty APR. Payments over the minimum will be applied as required by applicable law. As of 2/1/10, APR 24.99% & on all accounts in default, Penalty APR: 29.99%. Minimum Finance Charge $2.00. Subject to approval by GE Money Bank. Vision correction surgery is eligible for Health Savings Accounts (HSA) and medical Flex Spending Accounts (FSA). This means patients can use pre-tax funds to pay for these life-changing procedures. Depending on the patient’s tax bracket, this can mean a savings of 20 percent or more. The IRS has determined that LASIK is a tax-deductible medical expense. This ruling may give you an additional income tax deduction if you have LASIK performed. Many patients use credit cards to pay for their LASIK eye surgeries. We accept most credit cards. Patients who come to Hoopes Vision because of our track record of safety and proven results are often surprised at how affordable the very best vision correction procedures can be. We work hard to put our technology and expertise within the reach of almost any budget. 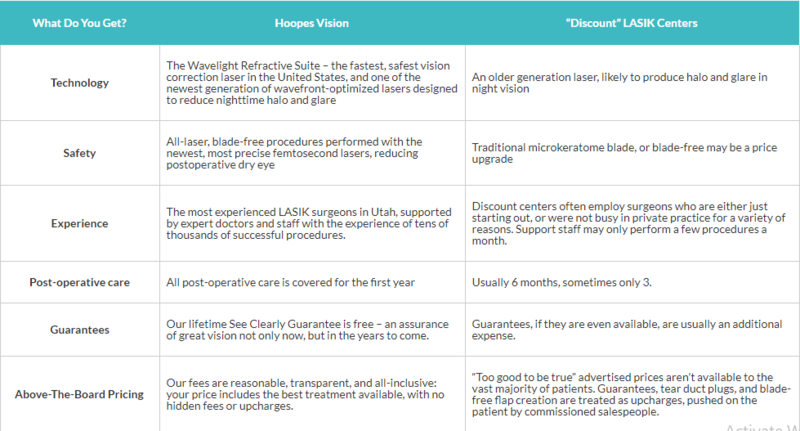 Hoopes Vision was the first LASIK center in Utah to offer patients a money-back guarantee of great vision after surgery. 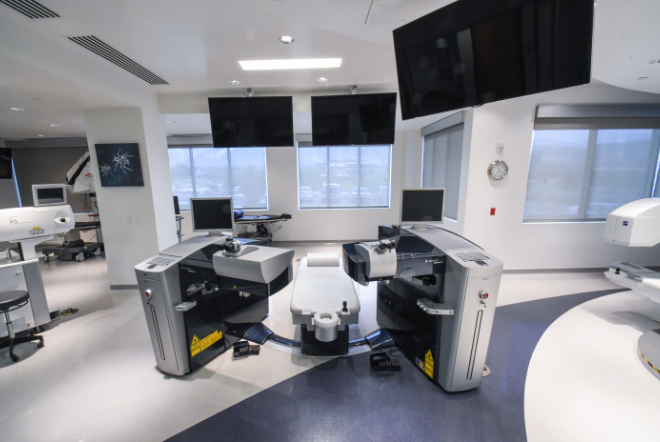 Our See Clearly Guarantee and Assurance Program reflects the confidence we hold in the effectiveness of our technologies and the skill of our surgeons. It is a free, full money-back guarantee if you fail to reach 20/25 vision or better within the 12-month postoperative period. We will also provide enhancements and touch-ups at no additional cost if your vision ever falls below 20/40, for life. Most patients, but not all, qualify for this free, lifetime guarantee. To learn more about the restrictions and terms of our See Clearly Guarantee and Assurance Program, please contact Hoopes Vision today or download the document here. With the introduction of lamellar refractive surgery in the early 1980s, mechanical microkeratomes have been used to create the corneal flap. Although three generations of mechanical microkeratomes have evolved, their mechanical principles are similar. The device consists of a fixation device, a suction ring, and a cutting device, which consists of a steel razor blade that oscillates at speeds between 1,000 and 20,000 cycles per minute. It is advanced across the cornea at speeds of 1 mm to 8 mm per second. There are a number of complications that can and do occur with bladed microkeratomes. These can be related to the suction ring, the microkeratome advancement system, blade abnormalities, and improper and poor surgical technique. In spite of significant advances in microkeratome head design (internalization of the advance system, higher quality blade design, and numerous electronic console feedback safety mechanisms), there still exists an ever-present risk of a serious complication every time a microkeratome flap is created. 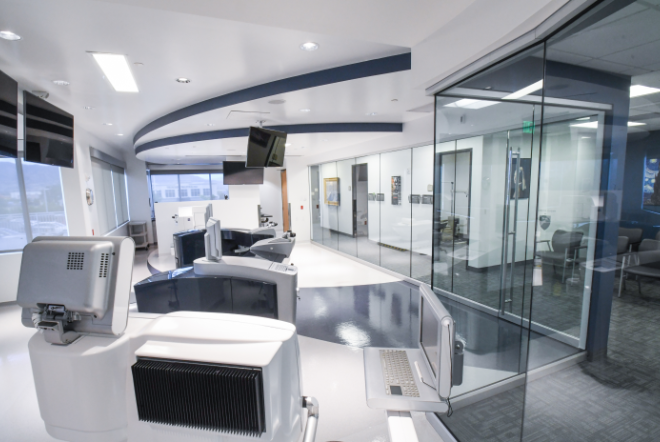 In summer of 2009, Hoopes Vision became the first Utah LASIK center to receive the newest upgraded version of IntraLase™: the new iFS IntraLase™ laser. This completely redesigned fifth-generation laser offers many advantages over older forms of IntraLase. Provide our patients with a safer procedure by eliminating the more serious complications caused by the bladed microkeratome. Provide an all-laser surgery for better precision and predictability. Reduce dryness after surgery. Several reports have demonstrated less dryness after laser flap creation. Reduce the amount of pressure buildup in the eye when compared to the bladed microkeratome. Doing so increases patient comfort and safety. Create thinner flaps, freeing up more tissue so that we can operate on patients with thinner corneas. Increase the chance of 20/20 vision or better. Faster procedure (creates a flap in as little as 16 seconds). Ability to make an inverted, bevel-in edge for the corneal flap. This modification allows the LASIK surgeon to tuck the edge of the flap underneath the periphery of the cornea rather than resting on top. This has been shown to create stronger flap adherence, with less chance of striae (wrinkles) post-LASIK. The corneal flap can be created in an elliptical shape which has shown an added benefit for patients with astigmatism.